In their last regular season meet, the Dakota State men’s and women’s track and field teams competed in the Dordt Invitational on Saturday in Sioux Center, Iowa. 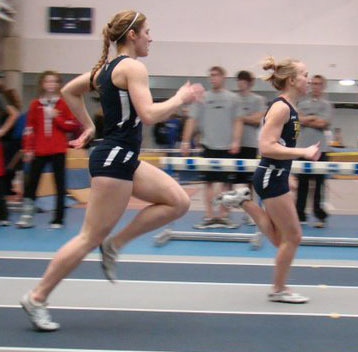 The meet featured many teams from around the area such as, Briar Cliff, Mount Marty, South Dakota School of Mines, Morningside, Dordt, Dakota Wesleyan, University of Sioux Falls and NCAA Division II Augustana. For the women’s side, Sophomore Brittany Young came away with the win in the women’s 600-meter dash with a time of 1:38.60. With her time, she provisionally qualified for the national meet and broke DSU’s collegiate record for the women’s 600 which was previously held by her. As of this weekend Brittany is ranked 17th in the nation in the 800 meter dash. She is also ranked 1st and 2nd in the conference in the 800 and 600. Senior Danielle Rowe placed 3rd in the women’s high jump. She jumped five feet, five inches which again qualifies her for the national meet. She is currently tied for 4th in the nation and 1st in the DAC. Sophomores Stephanie Uher and Claire Beck, race down the home stretch of the women's open 400 meter dash. The women’s 4×400 meter relay took 6th place and also broke DSU’s all-time record with a time of 4:12.23. Sophomore Claire Beck, Brittany Young, Senior Danielle Rowe, and Brandi Gau were the runners on the relay. 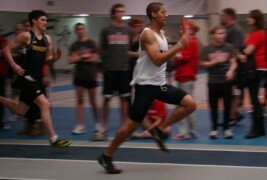 Outstanding performances for the men’s side include, Sophomore Andy Coy won the 1,000-meter run with a time of 2:29.79. With is time, he qualifies for the national meet. Coy has already automatically qualified in the 600, 800, and1 mile this year. In the nation Coy ranks 25th in 600, 9th in the 800, 9th in the 1,000, and 5th in the mile. Going into the final DAC conference meet, he ranks 1st in the 600, 800, 1000, and 1 mile. Senior Devon Berkness was 3rd in the men’s 1-mile run with a time of 4:31.5. Devon currently ranks 16th in the nation in the men’s 5,000 meter run. In the DAC he ranks 3rd in the 3,000 and 2nd in the 5,000. Other performances include, Amber Krogstad (13th in long jump – 15’7.5″, 9th in triple jump – 34’1.5″, 19th in 200-meter dash – 28.73 seconds and 10th tie in high jump 4’10”), Claire Beck (13th in 400-meter run – 1:03.75), Brandi Gau (12th in 200-meter dash – 28.22 seconds), Phil Carmody (12th in long jump – 19’9.75″), Shane Whidby (8th in weight throw – 41’5.75″ and 9th in shot put – 43’11.75″) Michael Hoffman (9th in 3000-meter run – 9:31.65), and Craig Bailey (7th in high jump 5’8.75″). This weekend, the team will travel to Spearfish, SD for the final DAC conference meet which will be hosted by Black Hill State University at the Donald E. Young Center. For those who want to look up the current national and conference rankings, check out http://www.tfrrs.org/view_list.html#46.